I Made it to Madrid!! It is probably the largest city I'll ever ride the bike through. Greater Madrid has nearly 7 mill!! I'm getting tired and not paying enough attention to the GPS and inadvertently found myself on a toll way heading for Madrid. The small print said no way out so I was committed. I was the only vehicle on the tollway so got very patient customer service at the toll booths getting on and off the tollway. It set me back a small amount only, and didn't save me anytime, well I don't think so anyway. I'd booked my accom so had an address to put into the GPS, but it didn't recognise it. Bother!! i found my way around by stopping at cafes and asking for help looking for my hotel. Got there only to find that parking provided as per their web site didn't really exist. They recommend I try the underground car park around the corner underneath the Plaza, beauty! 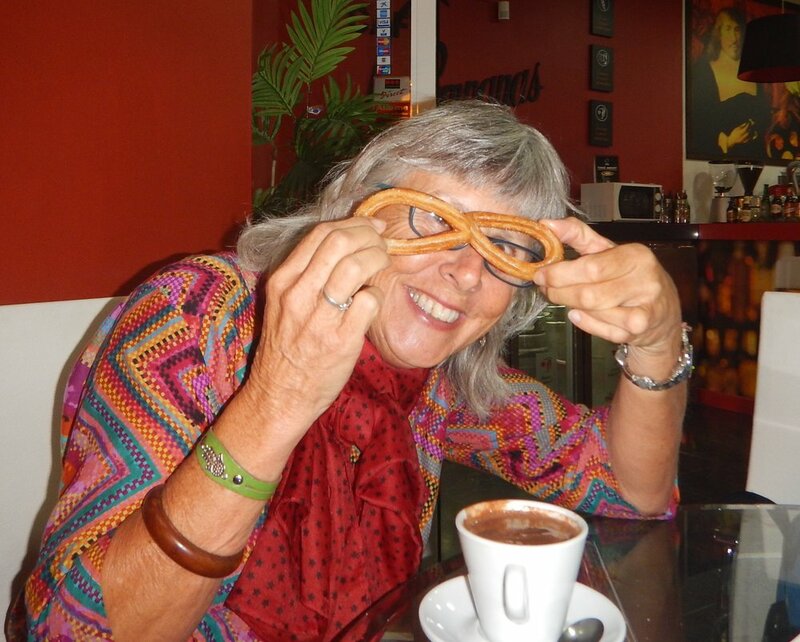 So I check it out on foot and remember that Debora suggested I have a hot chocolate with churros at midnight in the plaza in Madrid. Huh. I can do that!! Car park attendant said my bike would not be safe in the car park so I hoofed it back to the hotel and rode the bike into the ground level hallway. Hotel was from second floor up. Dumped my 5+ layers of clothing in my room and off to check out the plaza and surrounds. Live music, lots of people, food outlets everywhere, did I mention and lots of people!! After din dins I needed to walk for a bit only to find there is a plaza around every corner!! Thanks Deb, you didn't tell me that. Hopefully I'll go out again at midnight and have that hot chocolate. AND I did! Hot chocolate in hand, and it's pure hot chocolate, no milk !! Watch shows it was after midnight swapped the churros for local delicacy similar to Crema brûlée with burnt sugar crust. Yum!! Oh and chatted with Zorro number two! And one month later I got to sample churros.... done properly they are awesome. The only reason you have them with hot chocolate , I'm sure is so you can wash them down and they eat more!! they seems stale and way too crunchy. After finally finding some churros and having a midnight snack of them I was not really impressed and began to wonder what Debora was on about. However that soon changed, the next day after the church service, in the forecourt of the cathedral was a takeaway food caravan with a long queue of people, mostly men waiting to be served. That got my attention, so I moved closer to discover this is how they make churros. once cooked they are transferred to a sheet of paper, using long wooden chopsticks, then cut up with scissors and wrapped and taken away. You had the option of a cup of chocolate to have with them. I took mine to the nearest seat and promptly ate the lot.